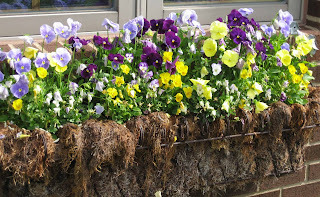 Do these pansies and violas look tired to you? Like many gardeners, including Susan down in Texas, I know these flowers won't last too much longer as the days grow hotter, but it seems a shame to pull them out now. They still look good. 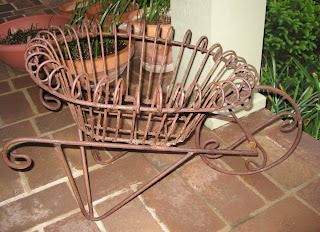 But I have new plants to plant here, and this is one of the last of the 'containers' that I need to plant up. So I think tomorrow, they are coming out. And while I'm replanting the windowbox, I think I'll refresh that moss lining. It's starting to look a bit shabby. I hope I have enough green moss to also line this planter. I still need to put something in this. Any ideas? It's on the porch, which faces south, but is somewhat shaded due to the nearby crabapple tree. And then once I plant it up, plus three more hanging baskets, which also need to be lined with moss, I think I'm done with containers for this year, at least until fall, or unless I see another plant I have to have. And I'm tired, but it's the good kind of tired that comes from physical labor, not that kind of tired that comes from over-thinking during the day. I might be more tired than usual because I mix my own potting soil, which means dumping 40 pound bags of top soil into the wheelbarrow and hand mixing in peat, perlite, and vermiculite. Over and over again. Around lunchtime I realized I was going to run out of top soil, so I went to the local Meijer to get some more. I always ask if someone can load it for me, because I have to unload it, and they always say they will call someone to come back and help. But no one ever shows up. I'm to the point that I ask for them to send someone to help, then I drive around and load it myself while I'm waiting. Oh, well, they are no worse than Lowes, who also said they'd send someone to help load but didn't. I wasn't sure how much more top soil I would need, so I got 20 bags. But when I finished up this evening I realized that "my eyes were bigger than my containers". Now I have extra top soil, maybe 10 bags extra. No matter, I'll use it eventually. 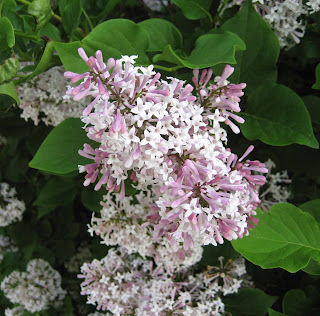 And all afternoon as I wheeled back wheelbarrow loads of top soil to the back yard, I made sure to walk on the side of the house where the 'Miss Kim' lilacs are blooming. Yes, they smell wonderful. And that was Friday of my gardening vacation week. But don't say that my vacation is over. I've still got Saturday and Sunday to enjoy. That week went by pretty fast! The garden is looking great and I can almost smell Miss Kim. The lilacs are lovely! You have been hard at work - mixing your own soil is a ton of work, literally. I hope you have some time to relax and to enjoy your garden over the weekend! I need to remove my pansies and violas from their containers on the front steps to free up the space for the summer annuals, but I just can't make myself do it. They look so happy right now. I admire your resolve! Carol — I'll be looking forward to seeing what you replace your pansies with. Mine are still in the pot; we had an unusually cool week here so they're still blooming and looking too lovely to pull up. Maybe next week . . .
Layanee... Vacation weeks always go faster than work weeks, don't they! And the lilacs do smell wonderful. Kate... Thanks for the comment, and I did relax some today, and will take it easy tomorrow, too! Gardenmama... I did get myself all cleaned up and went out to eat! Entangled... I haven't removed the pansies yet, so I don't know how much resolve I really have. Perhaps tomorrow, now that I have all the plants that go in the window box next. Susan... I'm planting lantana, African daisies and some sweet potato vines in that window box. I have all the plants, now I just have to do it!